Hurricane Florence was a valuable reminder to America of the kind of people we are as a nation. It provided the opportunity for countless examples of courage, perseverance and altruism. On the other hand, it showed once again the true and unfiltered nature of the Great American Nigro, “Africanus Criminalis.” Fortunately, it did so in a manner that could not be “filtered” by the Corrupt Leftist Media, which works so diligently to hide black crime from those foolish enough to be its customers. It must be in their DNA: Like New Orleans during Katrina, it didn’t take blacks long to begin their instinctive vandalism and looting. 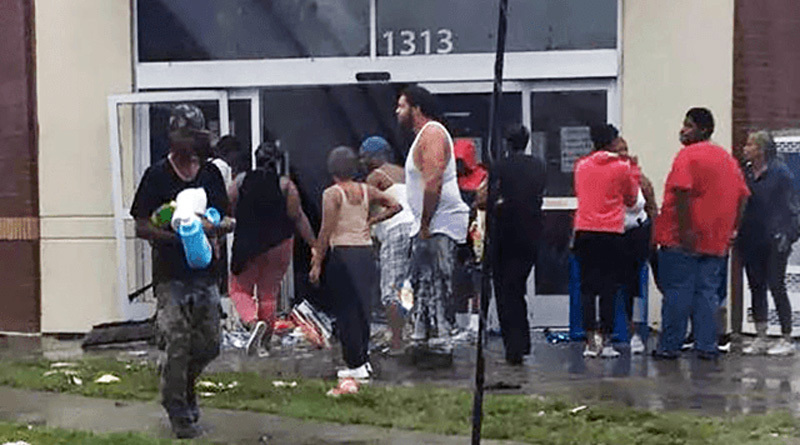 Two days after Florence reached landfall, local news was reporting large-scale looting of stores in Wilmington, North Carolina, accompanied by photographs of the participants. And, not a white in sight! When communists and other “Democrats” blame white racism and “bigotry” for the plight of the black underclass, they should be forcefully reminded that blacks are singularly responsible for their own plight: The absence of employers in the areas they’ve converted to ghettos is exclusively a result of this characteristic vandalism and looting. No one wants to live near criminals, not even the self-righteous hypocrites of the left, who routinely preach “integration” from their gated communities in Georgetown, Martha’s Vineyard, the Hollywood Hills, and the Upper East-Side of New York. Come to think of it, these areas would be a great place to build scattered-site housing fo dem po’ folkses displaced by hurricane Florence. As president of the Limousine Liberal Guild I object to the author’s contention that my members choose Georgetown, Martha’s Vineyard, the Hollywood Hills, and the Upper East-Side of New York due to its absence of low income minority housing. We love people of color and open our bike trails to city youth every year on December 25th for our annual “Cycling for Diversity” ride. Looks like a 100% chance of GIBS.